In Stephen Mannsfield's book, Faith of the American Soldier, the author explains how, in essence, societal evolution has forced a wedge between the soldier, faith, and war. 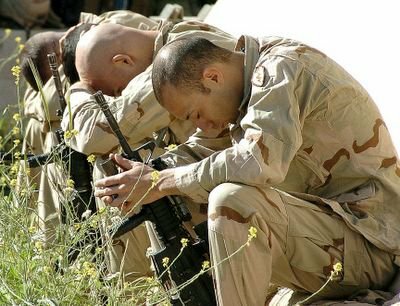 Fortunately, although chaplains are restricted now from saying or even implying that their cause is Just and God supports them, there are still religious services and spiritual counseling to be found. Unfortunately, this is perhaps the thing soldiers want to know the most to help them face what they must face and in sustaining morale. Chaplains are now also restricted from following their soldiers into actual combat, something (although unarmed) they want to do and has lent great strength to soldiers in previous wars. As a result, unique in this war, soldiers form and lead their own prayer and scripture groups. The author also surmises that, by and large, faith plays perhaps even a larger roll than in past conflicts.